Drawing for 1928 Silver Tone Crystal Pearl Collar Y Necklace Winner Drawn November 1, 2014. Pumpkin is the new black. Cheesecake lover's come hither. 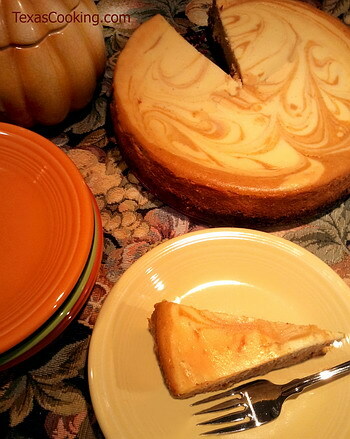 Our recipe in this newsletter is Pumpkin Marble Cheesecake, which is sumptuous. Do you have a good springform pan to bake it in? As always, if you make this or any of our other recipes, let us know how it turned out on our recipe message board. This week's Lone Star List features some choice tidbits from Texas, our regional publications and our food scene. This cheesecake is one of our most highly-praised recipes. The recipe for the pecan gingersnap crust is a prize in itself, but the whole cake is one you'll make again and again. Combine gingersnap crumbs, pecans and butter. Press onto bottom and slightly up the sides of a 9-inch springform pan. (See Note, below.) Bake for 10 minutes in 350°F oven. Remove and allow to cool. Combine cream cheese, 2/3 cup sugar and vanilla, mixing at medium speed of an electric mixer until well blended. Add eggs, one at a time, beating just until combined after each addition. Do not overbeat. Remove 1 cup batter from mixture and chill. Add remaining sugar (1/3 cup plus 2 tablespoons), pumpkin and spices to remaining batter; mix on low speed just until combined. Pour the pumpkin batter into the prepared gingersnap crust. Then pour or spoon the chilled cream cheese batter on top of the pumpkin batter. There will not be enough to spread in a single layer. Cut through the light and dark batters with a knife in circular motions several times to achieve a marbled effect. Bake at 350°F for 1 hour and 15 minutes. Loosen cake from rim of pan; cool before removing rim of pan. Chill before serving. If you want to remove the cheesecake from the base of the springform pan for serving, line the bottom of the pan with parchment paper cut to size before pressing in the crust ingredients. This recipe appeared in the article Puns and Pumpkins. We also have a recipe for classic New York-style cheesecake. NYT Mexican Coca Cola's becoming a true classic. World Booze - The best gins for martinis - oh, really now? Or, if you're still thirsty, Sir David Frost's son George interviews his new premium rum like it's Richard Nixon. Marfa Public Radio News: The Return of the Sul Ross Lobo Marching Band! We missed this, but the Austin Chronicle recently published this story about what's happening at the historic Scholz's Beer Garden, aka Saegerrunde Hall in Austin. VIDEO from Fort Worth, Texas: Are the generals just refighting the last battle of the burger? 2nd Annual Young Guns Battle of the Burger Recap from Fort Worth, Texas magazine on Vimeo.